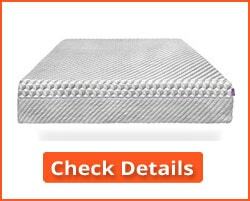 Our review of the best mattress for side sleepers takes into account the specific needs of side sleepers in a mattress. Do side sleepers really need a mattress designed for them? The trouble is that most manufacturers do not take this into account. That’s why we have reviewed the best seven mattresses that are suitable for people who prefer to sleep on their side. Our Buyers Guide that you will find after our mattress descriptions explains why this is the case. For now, it’s enough to say that side sleepers need a comfortable top to absorb the pressure of their shoulders, hips, and possibly even their arms and knees. This top layer should lie over a more dense support layer to take the weight of the rest of the body. The mattresses we discuss below achieve this. For consistency, we are discussing the Queen size here, though the comments apply equally to other sizes from Twin to King. * All of these mattresses seem excellent in their own way, and it was difficult to separate them because each has its own advantages. The Rating is therefore based more on their suitability for side sleepers than their general suitability for all types of sleeper. 1) A 1.5″ cotton and Tencel quilted cover is bedbug and dust mite resistant, offering a fresh and healthy environment for you to sleep on. 2) A 1″ layer of gel semi-open Lush Foam™, a patented form of premium gel memory foam that absorbs the heat from your body while you sleep. This layer absorbs the initial pressure of your pressure points – mainly your shoulders and hips. 3) A 3″ layer of adaptive 3.5 lb memory foam that not only cools you but also provides the pressure-resistance needed by your pressure points. 4) A 5.5″ layer of 2.2 ID hard supporting base foam. This construction comprising a soft top with increasingly harder layers beneath it, is not only perfect for side sleepers but also others with a relatively angular bone structure. The top layers absorb the pressure of the shoulders, hips and other pressure points, and also cools them down. The succeeding layers progressive absorb more and more pressure from the body, while also cooling it down. Ideal construction for side sleepers, providing comfort for the pressure points, and lower layers offering whole-body support. Core support also makes this mattress suitable for back and front sleepers. Gel memory foam keeps you cool while you sleep. Forever Warranty no time limit on the return of the mattress due to manufacturing faults. Home trial – you get a 365 nights trial to make sure Mattress is right for you. If it is not, you get a full refund and free uplift of the mattress. Very few – one or two complaints regarding the mattress being too soft – but this may likely not apply to side sleepers who need a soft top with a harder core. Read our note on warranties in the FAQs below. Editor’s Note: The Nectar Sleep memory foam mattress is ideal for side sleepers who need initial absorption of pressure from their shoulders and hips, but also support for the rest of their body one these pressure points have sunk into the comfort of the first 2-3 layers. The one-year trial is a good feature, but read our notes on warranties in the FAQs below. The Layla Sleep memory foam mattress uses a copper-infused memory foam that conducts heat into the copper which is then diffused away from your body. The foam itself is designed to absorb the pressure from your shoulders, hips and other pressure points, and so is an excellent mattress for side sleepers. Copper is an excellent heat conductor, and is also well known for its beneficial effects on those with joint pain and blood circulation problems. If you sleep on your side, then this mattress might be able to help you avoid pain in your shoulders and hips. However, there is no guarantee of this, but what is more certain is that this mattress will provide side sleepers with a good, restful sleep. Another positive for the Layla Sleep memory foam mattress is that it offers two sides. One for those that prefer a soft sleeping surface, and another for those that prefer a firm mattress. Comfort layer of 2″ of softer 1.8 lb convoluted foam. This provides good heat absorption and good airflow. 4.5″ of firm 2 lb foam with an ILD of 36 – this provides excellent support in either orientation. 1″ of 3.5 lb copper infused memory foam. This means that the mattress is flippable. If you flip it you get the hard side on top, with the above layers in reverse direction. The entire mattress is covered with a cover containing ThermoGel – a cooling agent that absorbs heat and keeps you really cool on hot nights. Well designed for side sleepers – if they use the soft side! Effective cooling effect – particularly useful on hot nights. 100 nights trial period – don’t like it? Return it free. Very few, although the flippability from hard to soft and vice-versa may create some family squabbles! Editor’s Note: The Layla Sleep memory foam mattress helps to keep you cool at night. It is very uncomfortable to wake up in the middle of the night in a hot sweat. This mattress helps you to avoid that. The flippable nature of the mattress is a good one, although side sleepers will be better staying with the soft side. This provides them with good sinkability of the top shoulder and hip, while also providing all-over body support from the layers below. It is, of course, also an excellent mattress for all sleepers who can choose the soft side to absorb the pressure of their pressure points while still keeping them comfortable. This is one of the reasons we rated this the best mattress for side sleepers in 2019. The Leesa mattress was developed by a new start company and has three layers. The top layer is a 2″ layer of Avena foam, perforated and convoluted for maximum air circulation and cooling power. It is also bouncy, which some couples may prefer in a memory foam mattress. The middle layer is memory foam which releases pressure on the pressure points: mainly the shoulder and hip for side sleepers, and also to a lesser extent, the arms and legs. The bottom layer is hard, high-density foam for core support. Without this layer, the sleeper would sink too far into the mattress. This is a unique design, fashioned by expert mattress technicians who formed their own company to develop and market it. The firm donates one mattress to a shelter for every ten it sells. 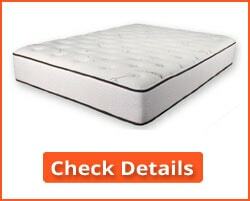 Offers more bounce than any other memory foam mattress: excellent for couples. 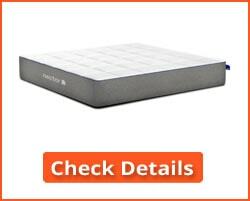 Not a lot to say – it is just a very good mattress for side sleepers and couples who like memory foam. One mattress donated to a shelter for every ten sold. 100 day trial period – free return if you don’t like it. Editor’s Note: In spite of the few complaints regarding heat and hardness, the vast majority of buyers love this mattress. It is a unique approach to a memory foam mattress, introducing a level of bounce that many people like, particularly young couples! 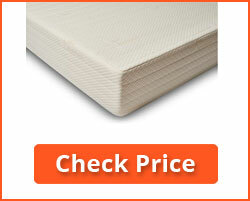 This 12″ thick memory foam mattress is suitable for side or back sleepers. The top layer is a 2.5″ layer of SureTemp memory foam. This provides a comfort layer for your shoulders and hips, and also allows the leg and arm in contact with the mattress to sink in slightly for more comfortable support. The lower 9.5″ layer is a premium support foam. This supports your body while your pressure points are cradled by the top layer. The Shiloh mattress has a soft poly-cotton blend cover. This cover is removable and can be machine washed. The entire mattress offers a refreshing sleep to side sleepers who can rest knowing that their shoulders, hips and other pressure points will not feel painful in the morning. As our other picks, this mattress provides excellent support for shoulders, hips and other pressure points that side sleepers sometimes worry about. Good bottom support for the entire body. Removable, machine washable cotton cover. All the benefits of memory foam. Some complaints about it being too hard for side sleepers. Some complaints about it being too soft for side sleepers – go figure! The vast majority of people who use this mattress for side sleeping like it. Editor’s Note: The Sleep Innovations Shiloh mattress appears to be an excellent mattress for side sleepers. If you prefer a slightly harder mattress to sleep on, then this is slightly harder than the two above. This is because of the harder support foam at the bottom. The washable cover is a useful feature and many users like this mattress very much. This is a memory foam mattress that could have been made just for side sleepers. The top layer of 3.5-inches of gel memory foam conforms to your shoulders, hips and other pressure points to offer excellent comfort. The bottom layer is a 7.5″ solid support foam base. 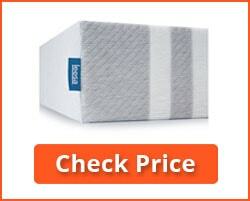 In case the thickness prevents air flow, there is a middle layer of 2″ ventilated air-flow foam that enables your mattress to breathe and keep you cool throughout the night. This combination of layers results in a mattress suitable not only for side sleepers but also back and belly sleepers. The three layers prevent you moving about too much in bed, while keeping you comfortable and cool for the perfect night’s sleep. Excellent support and comfort, while the middle layer keeps the bed aerated and you cool. Removable and washable zippered cover wicks away moisture and helps prevent odor. CertiPUR-US foams free of toxic fire retardants, heavy metals, ozone depleters and other noxious substances. Nothing significant: vast majority liked it. Some complaints of too soft or too firm. Editor’s Note: The construction of this mattress is ideal for side sleepers. It not only provides a soft surface for their shoulders and hips to sink into, but also a solid base for support. The central layer circulates air and keeps the mattress cool. The Tuft & Needle Adaptive foam is claimed to be an advance on standard memory foams. It is said to be more supportive (so good for side sleepers) with a good level of bounce. It provides good pressure relief for all types of sleeper, with good separation of movement between partners. Its superb cooling effect comes from a combination of gel and graphite incorporated into the foam. It is CertiPUR-US and the cover is Oeko-tex Certified. 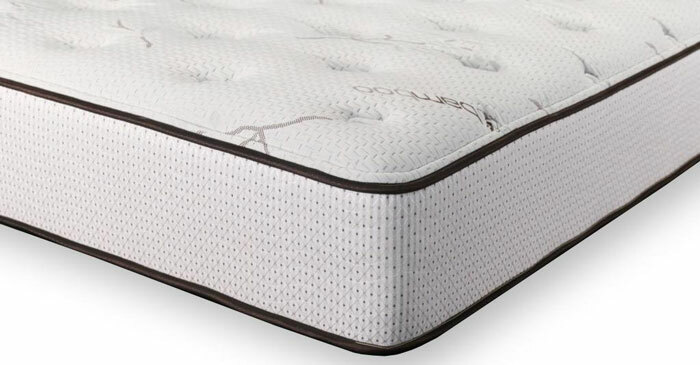 The mattress consists of two layers: 3″ of adaptive foam and 7″ of high density polyurethane foam. This adaptive foam works in a similar way to memory foam, but claims to remove heat more effectively without sacrificing bounce. The top layer absorbs the pressure of the shoulder and hip of side sleepers for a more comfortable sleep. The cover is Oeko-tex Certified for purity and safety of its ingredients. 100-night sleep trial – if you don’t like it you get 100% refund. Some complain that the foam forms an indent after a while. If that’s the case, it could be in the 7″ high density foam. 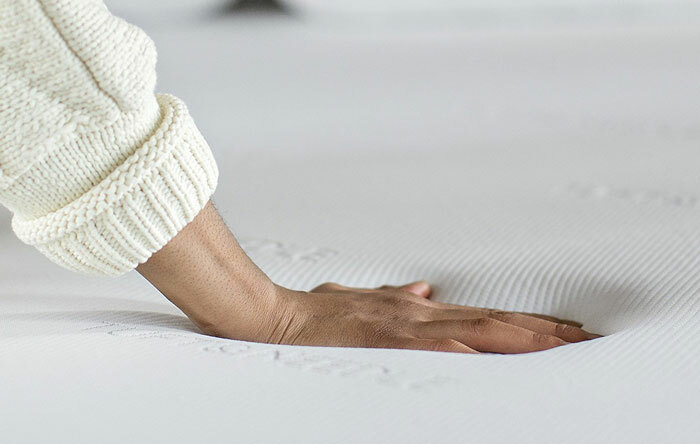 Editor’s Note: The foam used in this mattress is not a regular polyurethane memory foam, but a proprietary form of adaptive foam made using polyurethane. It responds to heat and pressure in a similar way to memory foam. It claims to be an advance on memory foam, and many of its users would agree – but not all. The DreamFoam mattress from DreamFoam Bedding is the only mattress in our list that is based on latex foam. 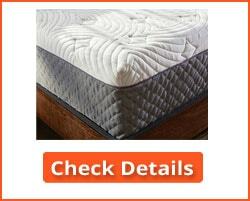 It is a 10″ mattress with a 1.5″ quilted bamboo textile cover that provides a smooth silky feel. 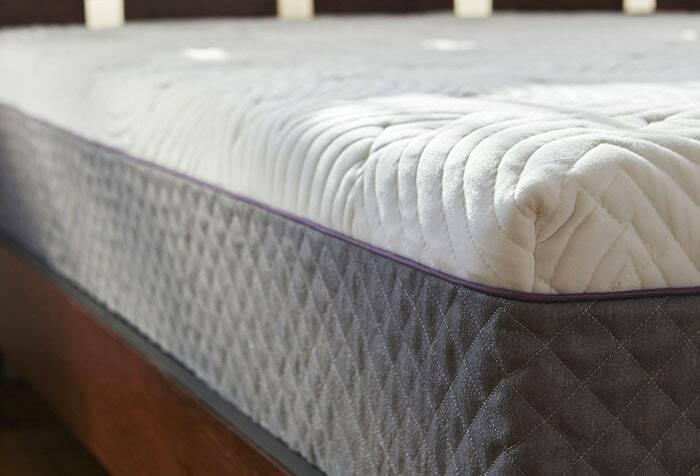 The quilting is a super-soft foam for maximum top comfort. Beneath that is 3″ of Talalay latex foam, a form of latex that is lighter and more aerated than traditional Dunlop foam. The bottom layer is 5.5″ of a convoluted latex foam that provides good air flow and support for side sleepers. One benefit of the DreamFoam Bedding mattress is that you can select your preferred comfort level from four provided. If you are not sure what yours should be, then simply “Ask Chuck” (the designer of the mattress) and you will be informed of the best level for you. Talalay latex foam is the best foam for side sleepers. It has give to support the pressure points while the solid foam base provides the necessary support. A choice of 4 comfort levels. 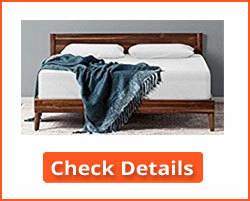 10-20 year warranty depending on product – not stated for this mattress. Some complaints that the latex foam does not withstand continual use. They say it tends to begin well, but sags after a few months. Some think it too hard and some too soft A consistency issue or different expectations? Editor’s Note: Many believe that latex foam does not provide the type of support needed for side sleepers. They may well be correct. However, many people who purchased this mattress have been very happy with it. Some do not like the feel of memory foam, and for those side sleepers this is the best of those that do not use this type of foam. It has been placed at #7 because it is late and not memory foam. However, if you prefer a latex mattress, then this is #1 for you! It doesn’t matter how you sleep on your front, your back or your side – when choosing a mattress you should first consider what parts of your body will be in most contact with the mattress. That is where most pressure will be put on the mattress. Correspondingly, that is also where most pressure will be put on your body! For a side sleeper (you – or you would be unlikely to be reading this review) most pressure will be on your shoulder and hip, and also likely at least one arm and a leg! It depends if you sleep with an arm under your chest, as many side sleepers do. However, the arm and leg are unimportant when choosing your mattress – what supports your shoulder and hip will also support these. But what about the rest of your body – will that not also have to be supported properly? Sure it will – and this is where the design of the mattress is very important for side sleepers. Your spine is a critical part of your body. When lying flat, such as on your back or belly, your spine must be kept in its natural ‘S’ shape. However, when lying on your side it should be maintained absolutely straight. If you look at your skeleton from the front or back you will see that your spine is straight from head to tail. From the top of your neck to the last bone in your coccyx, your spine is dead straight when viewed from front or back. Unless it is supported when you sleep on your side, it may bend – and that can cause a lot of orthopedic problems for you! So how is this done? If you lie down on a solid board on your side, you would feel pressure on your shoulder and hips. The central part of your body, from shoulder to hips, would be relatively unsupported. That part of your spine would then tend to sag over time. That would ultimately cause you pain. What you, as a side sleeper, need is for your shoulder and hip to sink into a soft layer of your mattress until it reaches a harder support layer that prevents further sinking. It must also support your chest and side, without allowing these to sink to the extent of your pressure points. That’s where the unique properties of memory foam become important! Memory foam softens with pressure and body heat. When you lie on your side on a memory foam mattress, your pressure points – shoulder and hip – exert pressure, and the foam softens slightly allowing your shoulder and hip to sink into the foam. They are still supported but are now at a lower level than your chest and waist. As your shoulder and hip slowly sink, your chest and waist also slowly go down with them. One your pressure points reach the support layer below, they stop and your chest and waist remain supported by the memory foam. They do not sink further because they are of greater area than your hip or shoulder – or elbow or knee! Your spine remains straight! That’s because the entire side of your body is equally supported by the memory foam. You get a similar effect with an innerspring mattress where the coils are held in individual pockets rather than connected together. Your pressure points – shoulder and hip – will exert more pressure on the springs they are in contact with than the rest of your side which is lying on a larger area of springs. So they don’t compress as much. However, memory foam does this much better. That’s why you should look for a mattress that has more than just the one layer of foam – memory foam or not. All of our seven recommendations have at least two layers, and six of them have more. The top layers allow the pressure points of shoulder and hip to sink into the foam through pressure and body heat. The lower layers generally stop this sinking and support the side of your body equally. This helps to maintain a straight spine while providing comfortable support to your side without undue pressure on your hips and shoulder. This can be achieved with or without memory foam, although the foam used should ideally be adaptive in one way or another to allow the salient pressure points (mainly hip and shoulder) to be supported without your entire body sinking down to base level! 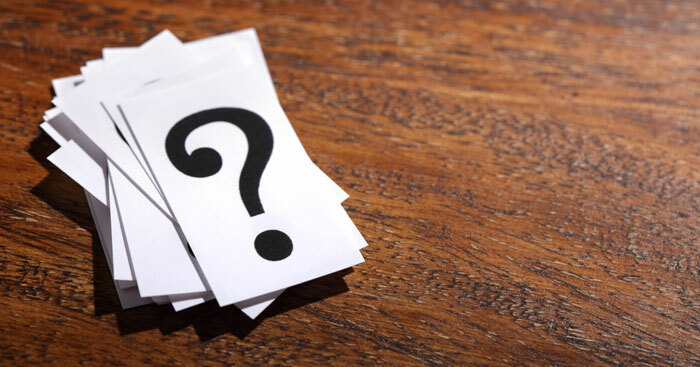 Here are some of the questions that we are most frequently asked by visitors to our website. 1. Why isn’t an innerspring mattress good for side sleepers? Some innerspring mattresses can be used, although the main reason for not using them is explained above. When you lie on an innerspring mattress, the mattress does not compress enough at your shoulder and hip to allow you to lie with a perfectly flat spine. You can certainly use a mattress with a spring core and memory foam top. The spring layer could at in the same way as the harder supporting foam in our examples above. However, none of those we considered were effective enough in providing comfort while supporting the spine to make our top seven. 2. What did people use before memory foam was invented? They used a soft latex foam over a spring base. A polyurethane foam may also be used. This fundamentally carries out a similar function to memory foam over a hard latex or polyurethane base. However, this set-up is nowhere near as effective as memory foam. That’s because memory foam responds to the pressure and heat of your pressure points to not only soften, but also to enable these points to sink into the foam which also supports the rest of your body without it sinking so much – thus maintaining a healthy flat horizontal spine position. 3. What's the story about Warranties? Some seem to be OK but others have so any disclaimers it's hardly worth having. Very true! You should always read your warranty carefully. The best deals are where you are offered a test period, or ‘sleep test.’ One of our picks above offers a 365 night test and three others a 100 night test. You get a full refund if you don’t like it. Where the main issue lies is with the 10-25 year warranties. Make sure you read the warranty conditions carefully and adhere to them. In some cases the warranty is invalidated if you wash the cover! In most, any indentation must be over 1.5 inches or even more than that before you can claim for sagging. Read the warranty! 4. 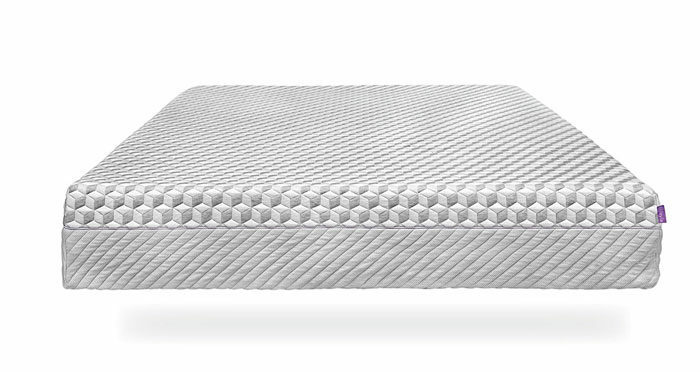 What is the best thickness for a mattress for side sleepers? Good question! The thickness of the top comfort layer/memory foam layer should be at least 3 inches to allow your shoulder and hip to comfortably sink into it. Under that there should be around 6 – 10 inches of other layers to help with both comfort and keeping your body straight when sleeping, rather than sagging in the middle between shoulder and hip. Our recommendations are between 10 and 13 inches thick. 5. What pillow is best for side sleepers? We recommend a pillow that supports your head and neck, and keeps it as loosely in line with your spine as possible. There are some excellent memory foam pillows available that would be perfect for side sleepers. The best mattress for side sleeper reviews were difficult to compile because side sleepers have specific needs – different to those of belly and back sleepers. The latter two need good overall support over a large area of their body. However, side sleepers need a mattress that allows their shoulder and hip to sink in, and also often an arm if they tend to lie with this under them. Once these pressure points have sunk into the top layer, the side of their chest and legs can then be properly supported. That means that a good mattress for side sleepers must have a soft top thick enough to absorb the shoulder and hip, and then a firm support layer beneath that. All mattresses for side sleepers included in this review have been chosen with this as an essential feature.